Greetings Mayhem & Mystery Fans! We have lots of exciting news for you. First, we have opened a brand new show! In Hippie Hoax, Harmony Song, Moon Beam Skye, Freedom Storm, and Blaze Summer invite you to their groovy Bohemian gathering. Give peace a chance as you learn the lingo, how to dress, how to be environmentally friendly, and how to embrace what is good all while protesting something dear to Freedom's heart. But not everyone wants to let their freak flag fly. Will this far out mystery make love and not war? Or will yesterday be a memory for one of the leaders? Will it be live and let live or live and let die? Join Mayhem & Mystery for this outtasight, groovy evening. The cast for this evening of interactive fun includes Jene Rebbin Shaw as Freedom, Tamra Francis as Blaze, Judy Shaw as Moon Beam, and Joshua Lisec as Harmony. These groovy hipsters can't wait to share their enthusiasm for peace while still making a statement. But what kind of crazy statement are they trying to make? Dig out your bellbottoms, tie dye and flower headband to show your hippie support. Harmony will serenade you with some great hippie songs. Brush up on the music and sign along. 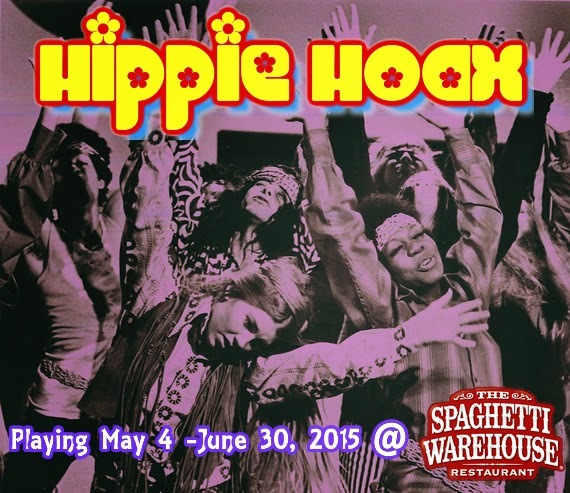 Hippie Hoax runs Mondays in Dayton through June 29, plus Fridays May 29 & June 19. Call the Spaghetti Warehouse at 937/461-3913. Or for shows in Columbus, join us Tuesdays through June 30. Call The Columbus Spaghetti Warehouse at 614/464-0143 to reserve your seat today. All performances are 7:00 PM. Dinner and the interactive show are only $25.95 (tax & gratuity not included). Our other big news is that we have a great new website! Check us out at www.mayhemmystery.us. We have photos, show info, and more. We update it regularly, so check it out often!